West Tisbury is the largest of the Vineyard towns in terms of area, stretching from the North Shore hills of Makonikey to the flatlands of the island’s South Shore. 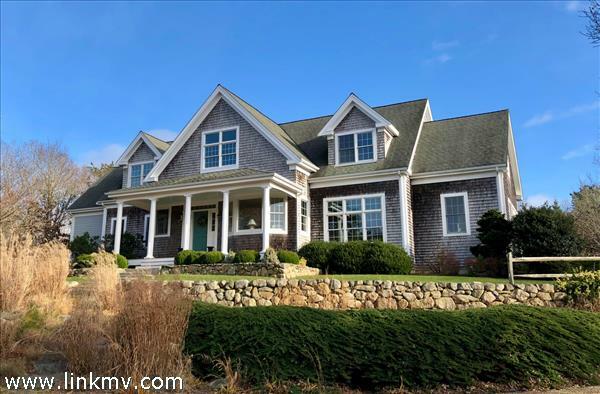 Many of the homes for sale in West Tisbury offer residents a great deal of privacy, with a combination of rural and waterfront real estate available. 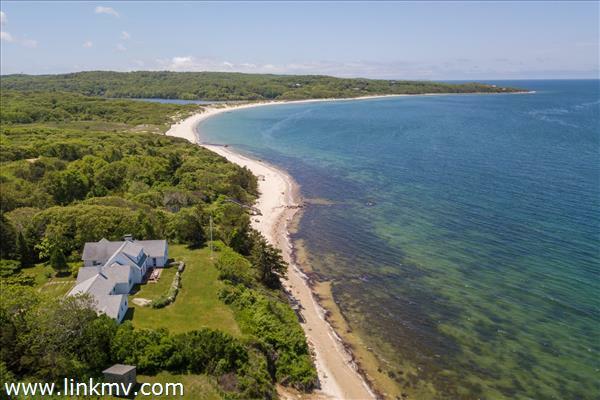 The landscape is also dotted with art galleries, boutiques and renowned Polly Hill Arboretum and residents love West Tisbury’s Lambert's Cove and Long Point Beaches. Learn more about West Tisbury. 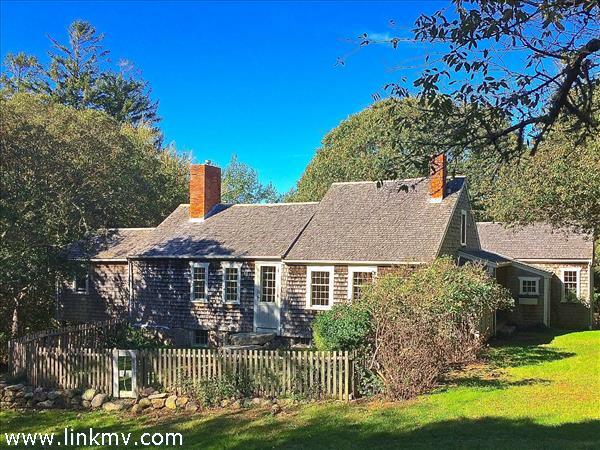 Questions about buying a home in West Tisbury? 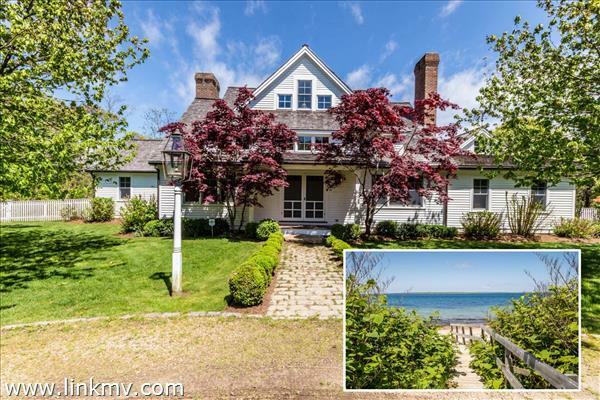 Spectacular waterfront setting on Vineyard Sound with private sandy beach. Enjoy unobstructed waterviews from almost every corner of this 2.0 acre site. 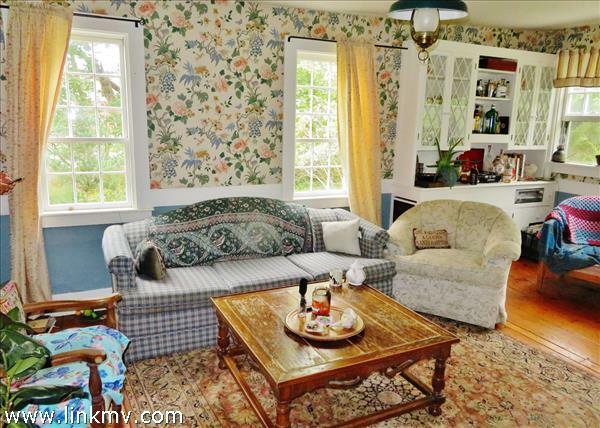 This home features Old-Vineyard charm and boasts 8 bedrooms. Enjoy as-is or create your Vineyard dream home. A magical setting not to be missed! A COUNTRY MANOR HIGH ON A HILL - Designed by owners who understand that elegance and relaxation can co-exist. A graceful stone wall and circular drive create a sophisticated setting on a large parcel of land. The community provides two private beaches within a ½ mile of the property. One beach is at the bottom of a dramatic overlook with spectacular water views and the other, more user-friendly with an ability to walk directly on the beach. As you enter the home, the crafted stairway separates the living space. The living room is enhanced with a classic Vineyard stone fireplace. The piece de resistance is the wood paneled sunken library beyond which becomes a quiet space for reading, games and creative chatter. A casual den leads to an en suite master bedroom with fireplace and private balcony. The meaning of cook's kitchen is not wasted here - there are two stoves and two refrigerators and an over-sized island. There are also a breakfast room and a grand formal dining room. French doors and windows overlook the expansive back yard and pool. Two en suite guest bedrooms with private balconies, one with a fireplace, occupy the second floor and enjoy distant water views. The third floor with more capacious water views, a full bath and balcony can be used as the fourth bedroom or another living room. Chic, European flavor on the Vineyard or transform to chic coastal contemporary. Click on the video tour in the listing under External Links for preview of the property. 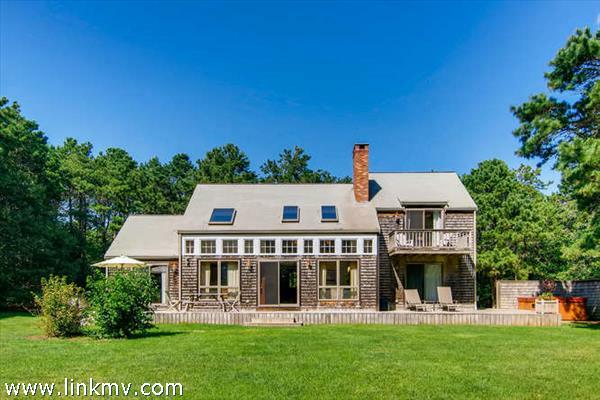 Sunny contemporary home in Nat's Farm offers a central kitchen/dining/living area with cathedral ceilings, living room with fireplace and granite seat, wood floors and a row of glass doors and windows overlooking the South facing sun deck and grassy lawn. Master bedroom suite with fireplace and balcony plus an open loft room all on the top floor. Two guest bedrooms on one side of the great room and a third guest bedroom with private bath and private outside access all on the first floor. Pleasant private yard with native mature plantings and manicured lawns surround the house. The sun deck is the full length of the South side and offers many areas for lounging and space for a bbq. Built-in hot tub and outdoor shower. As part of Nat's Farm, there is a private trail head to access State Forest trials. Also, ball field and tennis courts are across the street at West Tisbury School. From the moment you enter this property, one is struck by the beautiful landscaping and high end finishes of this custom home. From the inviting gourmet kitchen / family room with gas fireplace to the private MBR wing and spacious studio above the attached two car garage, this house lives large with generous living areas and attention to detail throughout.. An expansive wrap-around deck overlooks the enclosed back yard with in-ground pool, blue stone patio and lovely landscaped grounds. Truly, a must see! This lovely, unique home, nestled at the top of enchanting Indian Hill road, is warm with country charm and historic character. Recent extensive renovations include new windows, kitchen, bathroom and heating system, making this home comfortable for year round living. A covered porch welcomes you into the country kitchen complete with custom cabinets, soapstone counter tops and stainless steel appliances. The sun filled living room and wood paneled dining room each have fireplaces, beautiful wide pine floors and exposed timber ceilings. A cathedral post and beam addition houses the master bedroom suite with its own private bath, study and laundry. On the opposite end, is a second bright new bedroom and a charming renovated bathroom. The upper floor is its own separate sanctuary with a dormer ceiling bedroom and skylit sitting area. The heated walk out basement features exposed granite foundation walls and a beehive oven. A few steps from the house is the post and beam Studio which can also be used as an office and guest bedroom. The timber frame garage is spacious enough for a workshop and for storing bikes, surfboards and kayaks all conveniently accessible from the driveway. This 1.6 acre property is surrounded by pastoral beauty with mature trees, rolling hills and stone walls, all within a short distance of the trails of Cedar Tree Neck and hundreds of acres of conservation land. Look no further for a property with the living space you need! Currently there is more than 4,000 square feet of finished space ... but wait! The ground level has an additional 3,000 square feet of unfinished space. Pastoral, private, and peaceful... An amazing locations not far from all the island has to offer. Located on a paved road on 9.5 acres of land, this spacious home features four bedrooms and four and a half baths with expansion possibilities of up to seven bedrooms. This post and beam style home has had light use since construction by current owners in 2006. Home has a large living room with vaulted ceiling and fireplace and yellow heart flooring. Great room is open to the gourmet kitchen and breakfast area. Many windows allow natural light to filter through the space. This level has two bedrooms, two and a half baths, and a spacious library. Enjoy out door living on the large deck or covered porch. The second floor has the two additional bedrooms and two full baths. The 7 bedroom septic would allow you to create a space on the ground level. This space has approximately 3,000 sf of space with large windows. The three car garage is an added bonus. 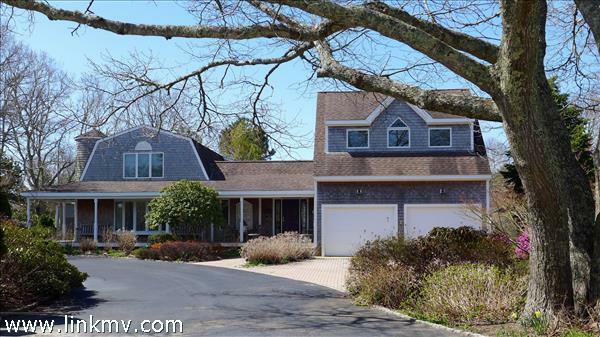 Enjoy all West Tisbury has to offer from this property. If you are looking for a property with character, "The Suzie Scott House" has more than you can imagine. Built in circa 1850, the current owner purchased this well maintained home as part of a long time family owned Estate. This sweet Antique sits on 1.4 acres with several out buildings (including the original out house converted to a shed). This is a property to really make your own, while keeping the character of the era, and still putting your stamp on it. Enter through a screened porch which leads into the Main Living space. A large room at the front of the house, off the Living Room (now being used as a bedroom) could be easily converted into a Family room / Office. The cozy Kitchen with dishwasher, washing machine and extra large gas stove could be a beautiful restoration project. A dining, sitting room and 2 more bedrooms finish off the main level. A small staircase leads to 2 second Floor bedrooms and 1/2 bath complete this very special listing. When the current owner purchased this home, the community was thrilled to learn that he was keeping the house, with all its character, in tact. Any way you choose to go, this is a beautiful piece of property ! There is something to be said for mixing some old with new to create a unique "Vineyard Home". 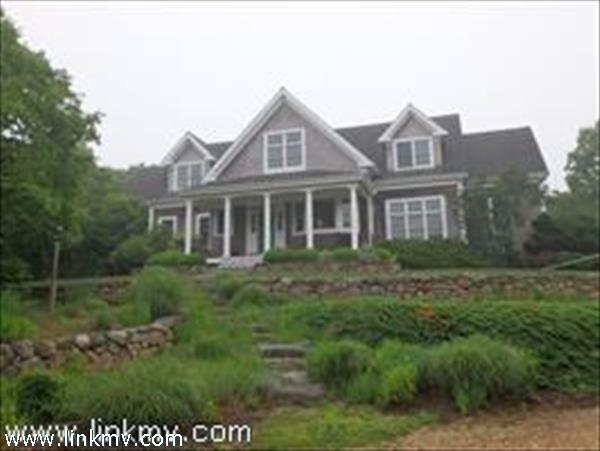 Classic Deep Bottom Pond shingled style 4,500 square foot custom designed home. Open floor plan with wood floors and central air-conditioning. There is a first floor Master Suite, powder room, gourmet kitchen and separate sunny breakfast nook, formal living room, spacious family room with fireplace, cathedral ceiling, and built in bookshelves, and separate dining room. There are two additional bedrooms, a full bath and large loft on the second floor. The full basement provides plenty of storage space and the detached 2 car garage contains a full bath, kitchenette, and large bedroom. All sited on a beautiful 2.8 acre hilltop location with terraced rock wall gardens, lawns, and landscaping. This custom home is beautifully designed and built for today's living. The main house has a spacious and casual floor plan that offers a design perfect for large families, entertaining and summer guests. Features include a grand living room with cathedral ceiling, granite fireplace, custom built in cabinets and french doors that lead to a covered porch and deck. The fully equipped chef's kitchen has a center island, corian counters, a sun-filled breakfast room and separate laundry/mudroom. The front parlor and formal dining room offer added living for special occasions and entertaining. The first floor master suite has it's own private outdoor patio, an office area, a full bath with soaking tub and shower. The second floor includes 2 spacious bedrooms that share a full bath and a generous family room. Beautiful wood floors, many nice details throughout. The detached garage is finished with a 2nd floor bedroom/studio, kitchenette, heat, a/c and full bath. The grounds are beautifully landscaped with lovely perennial gardens and mature plantings. 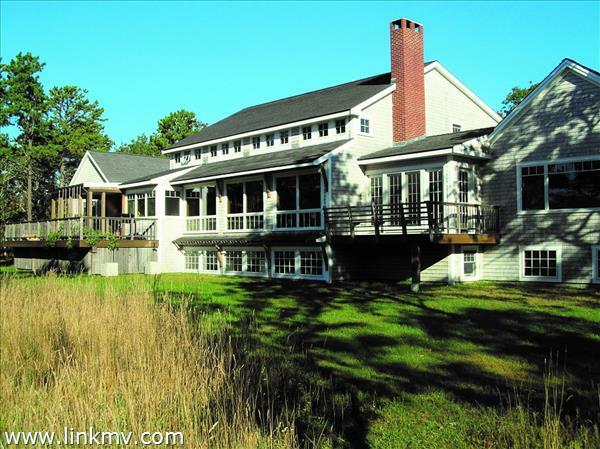 Carefully sited on 2.80 acres for added privacy with plenty of room for a pool and pool house. 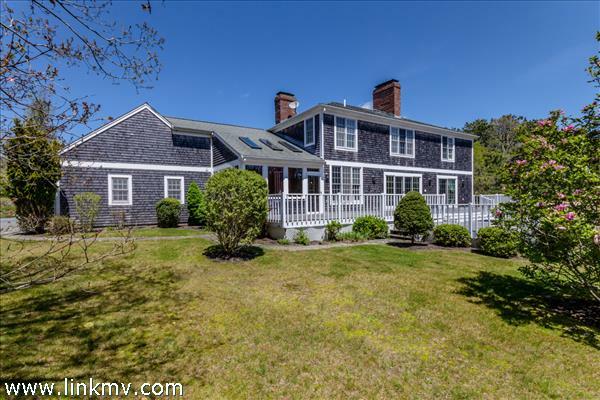 Association tennis courts, several walking trails and access to a private dock on the Great Pond for small boating and traveling to the barrier beach. An exceptional property!